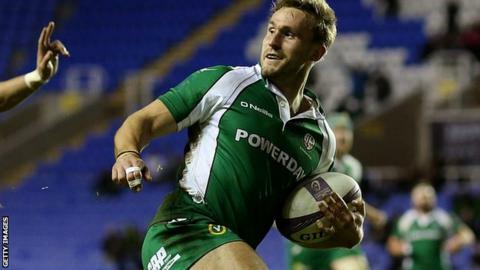 London Irish back Andrew Fenby says his hat-trick of tries against Edinburgh in the European Challenge Cup came after weeks of frustration on the sidelines. Fenby, 30, made his first appearance since the opening Premiership weekend in mid-October on Saturday as Irish moved to the top of their pool. The 38-6 victory at the Madejski Stadium included six tries for Irish. "It's been a frustrating season so far with not many opportunities for me," he told BBC Radio Berkshire. Fenby made the switch from full-back to blindside wing as he was named man-of-the-match in his first start since 18 October. "Being out of the side has been incredibly frustrating," the former Scarlets player added. "It's part and parcel of professional sport really. Especially now with the investment we've made and the great players we've signed in the back three. "There's loads of competition and it's all part of staying positive and waiting for your chance. When it comes, you've got to take it." Irish top pool five after three games and face Edinburgh again at Murrayfield on Friday. But, The Exiles are still without a win in the Premiership after losing their opening six games. Fenby hopes they can take the confidence of their European campaign into domestic competition. "It's about gaining momentum," he said. "We're desperate for that first win in the Premiership, but know we've also had a tough run in our opening fixtures."